You can also use a tsp. of mint sauce. Lightly mix all ingredients together fingers and place in a dome shaped mould. Pack down and carefully place on a plate. Flat bread – Most super markets will stock them. Find a nice multi seed or Mediterranean style flat bread. 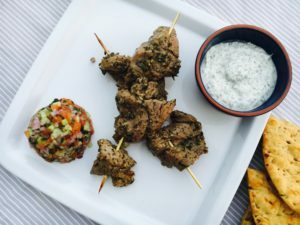 Add the lamb and the yoghurt dip for a truly delicious meal. Enjoy!